A concise, yet complete, explication of the tactics for devaluing women's accomplishments. A feminist classic that remains painfully relevant. Witty, yet terrifying. With a new forward by Jessa Crispin. Are women able to achieve anything they set their minds to? 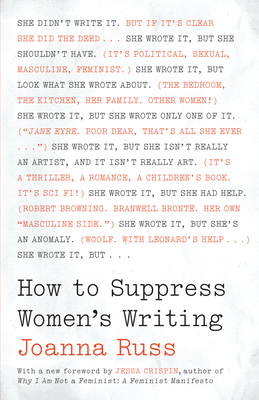 In How to Suppress Women's Writing, award-winning novelist and scholar Joanna Russ lays bare the subtle--and not so subtle--strategies that society uses to ignore, condemn, or belittle women who produce literature. As relevant today as when it was first published in 1983, this book has motivated generations of readers with its powerful feminist critique. "What is it going to take to break apart these rigidities? Russ's book is a formidable attempt. It is angry without being self-righteous, it is thorough without being exhausting, and it is serious without being devoid of a sense of humor. But it was published over thirty years ago, in 1983, and there's not an enormous difference between the world she describes and the world we inhabit." "A book of the most profound and original clarity. Like all clear-sighted people who look and see what has been much mystified and much lied about, Russ is quite excitingly subversive. The study of literature should never be the same again." "Joanna Russ is a brilliant writer, a writer of real moral passion and high wit."